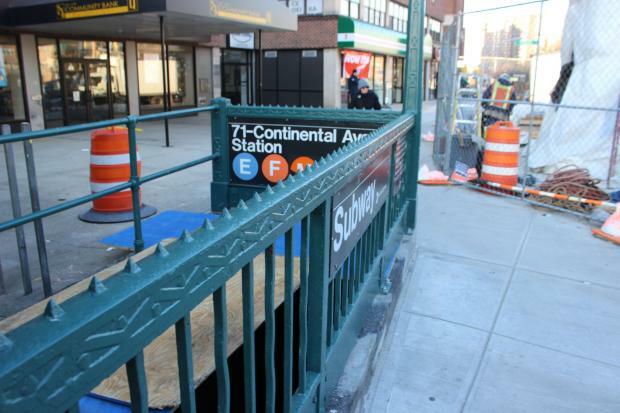 QUEENS — A project to improve access to one of the busiest subway stations in Queens has been delayed by three months, until March 2014, the MTA said Tuesday. Work at the 71st Avenue station in Forest Hills, where the E, F, R, and M lines stop, started about two years ago and was scheduled to be completed in January 2014. Fliers announcing the January 2014 completion date are still posted around the station, located close to the hectic Austin Street shopping strip. “It’s a shame that it takes so long to do something, that people have to be inconvenienced, that businesses have to suffer, that the elderly and the handicapped are affected,” said Stephen Melnick, a longtime Forest Hills resident. The MTA said the delays are partially related to problems caused by Hurricane Sandy. Required electrical work also took longer than expected. The $24.7 million project will eventually bring three elevators, including one at street level, a significant upgrade for handicapped commuters. It will also bring two new mezzanine-to-platform staircases to the station, refurbish staircases leading to the street and improve electrical and signal installations. "The project is 85 percent complete," said Marisa Baldeo, a spokeswoman for the agency. During construction for the new elevator, however, one of the station's exits on the south side of Queens Boulevard has been closed, leaving only one entrance open. “The sooner they get that other station entrance open the better, because right now everyone is using that one exit," Melnick said. “It’s overcrowded and dangerous,” he added. The project also temporarily closed portions of the surrounding service road and sidewalk, isolating businesses located behind the construction area. T-Bone Diner was one of them. "We lost a lot of business," its manager, Alberto Muniz, said. "It’s been a problem, because our customers had a hard time getting here,” he said. The Forest Hills station is among the busiest in Queens. In 2012, it ranked 5th in ridership in the borough, according to the MTA, with average weekday ridership of about 27,500. Currently, the closest stations with elevators are Union Turnpike in Kew Gardens and Roosevelt Avenue in Jackson Heights.